19 July 2009: In office less than one year, the mayor of the Venezuelan capital continues to act as an unfortunate reminder to Hugo Chávez and his United Socialist Party supporters that the Bolivarian revolution was kept in check by the 2008 local elections. Ledezma, leader of the centre-left Fearless People’s Alliance, began his civic career in the capital as governor of the former Federal District in 1992, going on to become mayor of the Libertador municipality in 1996 and of the new Metropolitan District in 2008. Since becoming mayor he has battled constantly against the national government, even going on hunger strike to protest at the usurper of his powers. 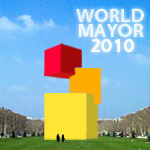 Mayor Ledezma was awarded sixth place in World Mayor 2010. Update 9 December 2013: Antonio Ledezma re-elected as Mayor of Caracas. Born in 1955 in San Juan de los Morros, Guárico state, Ledezma graduated from the Lyceum Juan German Roscio with a social sciences degree in 1973. He later attended the Universidad Santa María in Caracas, where he took law. During his undergraduate days, Ledezma became a leader of the student body and quickly migrated into party politics as a member of the left-wing party Democratic Action, securing election to its national committee. His first foray into electoral politics was within his home state of Guárico, where he served as a deputy to the state legislature from 1979, having served as a member of its administration from 1975. Having served as chairman of the state’s public works committee, he then secured national office in 1984 as a deputy to the National Assembly, serving two mandates with re-election in 1989. Subject to term limits, Ledezma was appointed by President Pérez to be governor of the now defunct federal district in 1992, though he was subsequently removed from office a year later when Pérez was forced out of power. A year later he resumed his political career as a Senator, becoming Vice President of the Senate and unsuccessfully proposing constitutional reform. The senate was eventually abolished under the 1999 constitutional reforms which also reshaped the city governance arrangements for the capital. In the 1995 local elections, Ledezma successfully contested the elections for mayor of the Liberatador municipality, the largest of the five that make up Caracas. In post as mayor, Ledezma served as chair of the council of Caracas municipalities, vice president of the Union of Latin American Capital Cities and chair of the National Association of Venezuelan Mayors. His policies as mayor included the expansion of public transport, as well as a crackdown on street vendors and undocumented migrants. Ledezma received a second mandate as mayor of the municipality in 1998 but was defeated by Chávez ally Freddy Bernal of the Fifth Republic Movement (now a PSUV executive) in the 2000 polls. Ledezma rejected the results as fraudulent, the first in a series of spats with Chavez. Ledezma’s political struggles out of office were not confined to the new government of Hugo Chávez, as he unsuccessfully sought the leadership of Democratic Action in 1999 but lost out. By 2000 however, Democratic Action, once a major political force of left-wing intellectuals and cultural figures, was a shadow of its former self, having reduced its tally of deputies in the assembly and being associated with several discredited presidencies. Ledezma and several members defected to a new party he founded, the Fearless People’s Alliance, which he presides to this day. During his period out of office, Ledezma opposed the policies of the Chávez government as a de facto opposition leader (though outside of the electoral arena), accusing it of electoral fraud and even indoctrination of children. 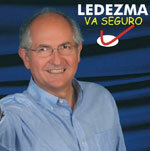 In 2004, Ledezma claimed to have been harassed by the country’s military police, through unlawful detention. Otherwise, during this period he engaged in a series of graduate studies, at the Institute of Higher Administrative Studies and the Metropolitan University of Caracas. Ledezma resumed his electoral career and within the Caracas city government with a run for the Metropolitan Mayor of Caracas in 2008. The elections were subject to a pact by the anti-Chavez opposition parties, which originally saw Chacao mayor Leopoldo López as the frontrunner, though he was later disqualified on account of an administrative sanction concerning an alleged conflict of interest, a charge rejected as “unconstitutional” by Lopez and his supporters. In this, Ledezma then emerged as the pact’s candidate against the PSUV’s Aristóbulo Istúriz (whom he defeated and replaced as Liberatador mayor) for the mayoralty, defeating him with 52 per cent of the vote in a set of national elections which saw Chávez’ popularity questioned by a resurgent opposition. As with the mayoralties of Leopoldo López and Henrique Capriles, Ledezma has become something of a lightning rod for the opprobrium of the PSUV government under Chávez. This began in earnest not long after Ledezma took office in January 2009, when he was effectively prevented from entering his own city hall by PSUV supporters, said to be angry over the new administration’s dismissal of Chávez supporters from the city payroll. More recently, Ledezma went on a six-day hunger strike to draw attention to the plight of his and other opposition mayors’ removal of powers by the Chávez presidency. The Organisation of American States later agreed to examine the constitutionality of Venezuelan government’s treatment of local autonomy under such routine power-grabs. The removal of the powers of the Caracas mayoralty began in late 2008, when the federal government assumed control of the city police, this leading to disturbances in January 2009 when the police backed the PSUV supporters preventing Ledezma from entering the city hall. In April 2009, the national assembly passed a law redefining the role of the capital’s mayoralty, in effect passing its powers and resources to a presidential appointee, in this case Jacqueline Farías of the PSUV. Ledezma has requested that the country’s electoral council hold a referendum on the move, which has so far been rejected, while an opposition lawyer has also petitioned the national constitutional court, claiming a breach of 10 articles. Legislators for the PSUV countered that the move was an “act of justice” for the poor of the Liberatador municipality, the only such local authority under the control of the PSUV, which it claims is denied much-needed resources by the metropolitan mayoralty. Those defending the ‘reforms’ to the capital’s governance arrangements claim it is needed to maintain the Caraqueño character of the city and get to grips with rising crime, rubbish and homelessness. Given that Caraqueño reforms have been non-stop over the past decade, with the abolition of the federal district and creation of the capital district and metropolitan mayoralty in 1999 and now this characteristic centralising measure, the battles faced by Ledezma and Lopéz are likely to intensify so long as both camps enjoy elected legitimacy within the Venezuelan state.